Analysis is dominated by simply opinion and therein lies the problem. Economics has become nothing like a science. In physics, one observes and then determines the “LAWS” as to how the universe functions. In the field of Economics and Finance, there is no science whatsoever. The whole thing after Adam Smith and David Ricardo started to go downhill rapidly with the Marxist and then Keynesian assumption that man was capable of manipulating the economy. This idea has been the most devastating assumption perhaps ever created. It still was self-evident in the Vice Presidential debates where Scrappy Joe Biden bullshitted everyone with his flowerly Marxist hatred that the “Super Rich” are to blame for having any wealth at all and government somehow had nothing to do with it. He adopted the position that the Middle Class has fallen behind because the “Super Rich” made money and it is their responsibility to bail out the Middle Class not Congress’ fault for creating excessive debt and unfunded liabilities. The problem is very simple. The President’s own budget shows that for the period 2013-2022, total non-defense spending will be $5.6 trillion whereas the total handed to the bondholders even at these low rates will be $5.8 trillion. Biden lied to the people to win an election. He wants to take everything from the “Super Rich” (couples who earn $250,000 or more not Buffett & Gates), and hand it NOT to the Middle Class, but to the bankers!!!!!!!!!!!!! Let’s tell the damn truth for just one minute. And what will happen after you raided the “Super Rich” so they have nothing left? How will you pay the bankers then? What will be next? Oh we go to a gold standard without monetary reform and then they redeem the bonds for all the gold? Then what? Outright civil war? There is a ticking time bomb nobody seems to be talking about because it takes OBSERVATION rather than opinion. The artificially lowering of the interest rates has stolen the retirement income from the elderly. But they must be part of the “Super Rich” Biden hates so much. Their income is handed to the bankers for there is no law that they had to pass the lower interest rates to the consumer. So we end up with 3 year CD-rates at 0.5% and a 3 year secured car loan at almost 4%. That spread is destroying capital formation. Oh yes – that is the bankers. That’s ok! 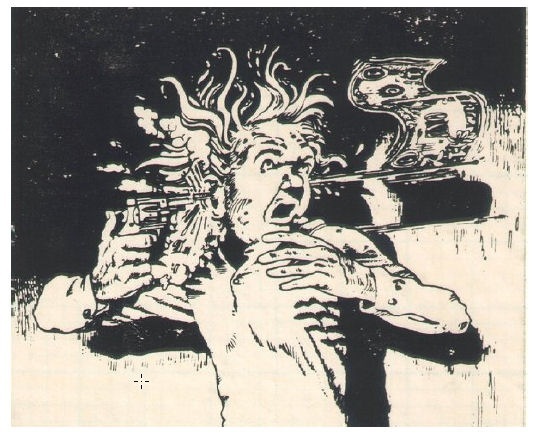 Biden specifically says Wall Street, so the investors and stock brokers will be hunted down and killed during civil unrest – not the bankers. The bankers are nowhere near Wall Street and they are known as the “Financial Services Industry” not Wall Street. Of course when there was the Occupy Wall Street movement, these types of lies by Biden help to protect the bankers and embarrass the stock brokers. In New York, apparently young brokers are no longer proud of their craft and tell potential dates their career in a lower tone. After stealing the retirement income of the elderly, they have set the stage for an exponential PHASE TRANSITION (PANIC) whereby interest rates can simply explode to the upside. Why? Pension funds and everyone are sitting there holding bonds. This is like owning the Nikkei at the peak in 1989. There is ABSOLUTELY nowhere to go but down. The assumption that government can control the economy and interest rates is dead wrong and that was the very same believe that led the Japanese to keep holding their portfolios because the government would make the Nikkei go back to the old highs so they could sell. The Marxist-Keynesian world of manipulation is false. It has not merely led to the death of tens of millions of people in social revolutions, but it is about to destroy Western Civilization in a single bound. Because everyone is sitting there holding worthless government paper, we will see a collapse in bonds equal to if not greater than the fall of the Nikkei from 1989 or the Dow Jones Industrials during the Great Depression. The slightest up-tick in interest rates will cause a massive PANIC sell-off like we have never seen before. Those who think there will be some PEACE DIVIDEND when Iran falls are dreamers. Russia is rising from the ashes. China will soon be the Greatest Economic power on earth. Hello? The rise of Asia is on the horizon. Even in South East Asia the “feeling” is the United States has become irrelevant economically as China begins to dominate the region. Here is a table of illustrating an important shift in trend. 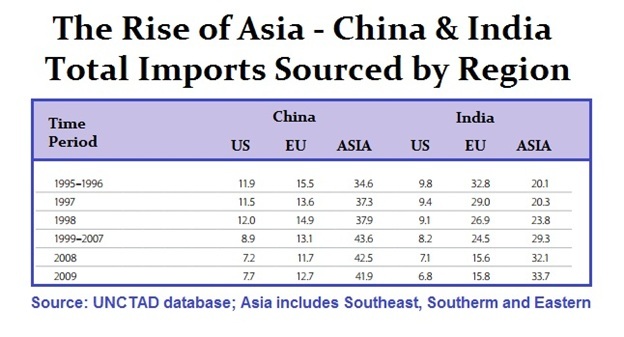 Here we are looking at China and India from their import perspective. This reflects and important shift in the underlying trend and is why the United States is in a serious decline. The recent US law seeking to go after any American doing business overseas assuming they are hiding money from taxes, shifts the focus of government away from the benefit of society to the greed of government. Hence, the decline in the United States as a world economic power has been enhanced by this legislation. While Joe Biden portrays the greed of companies that has led to jobs leaving America, what he fails to understand is global competition. The taxation has been driving jobs away because it is like a football in a game being thrown back and forth between two teams with no fixed plan of schedule. Government believes it has a right to change the tax code whenever it needs money. They do not understand how companies will not hire during uncertainty, and companies need a business plan to function. They need certainty what the taxation will be to establish budgets. Politicians are used to printing and borrowing whatever they need like a 14 year old with Daddy’s credit card. There is such a thing a business management. Western governments are too caught up in Marxist ideas that they can manipulate the economy whenever they like, that they play by nobody’s rules ever. The West has taken a gun constructed from debt to its own head and pulled the trigger. Joe Biden demonstrates clearly there is no plan, no observation of what is the problem, nor was there any clear explanation of how to solve the problem other than rob everything he can from the “Super Rich”. It is simply politics as usual. There is nothing left of any meaning. Politics has completely failed just as it did in the Roman Republic. It is not Democracy that has failed since politicians have done their best to eliminate the vote of the people on spending or major policies. We have a Republic with so called representatives to do as they please in the name of the people. Even in Europe, political powers refused to allow the Greek people to vote as was the case in Italy. So unfortunately, interest rates cannot be controlled as they assume forever. The huge 800 pound gorilla hiding in the corner of the room is waiting to be noticed. 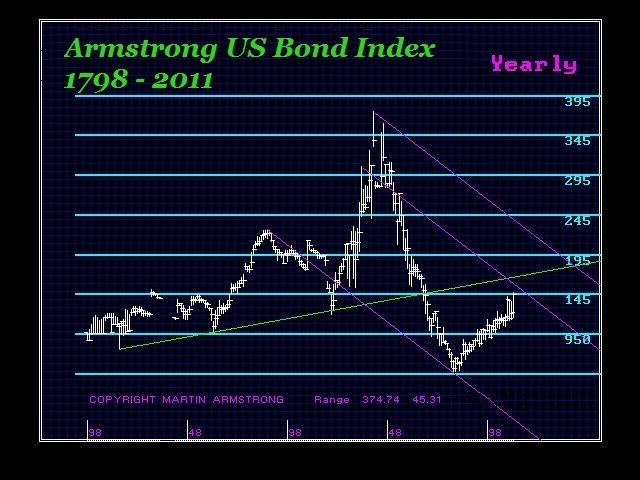 Here is our famous US Government Bond Index. 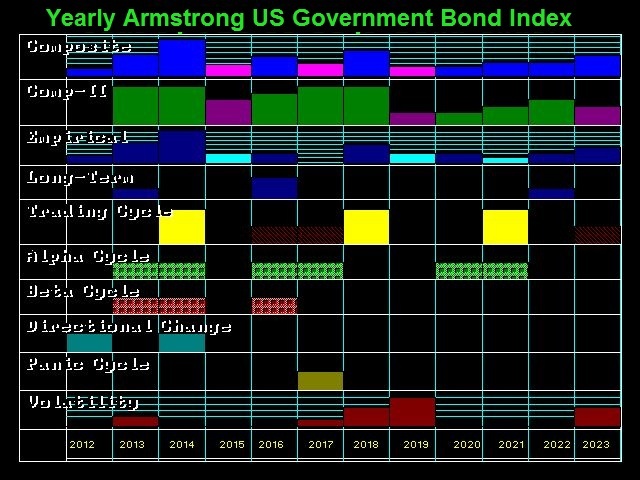 This chart illustrates how we constructed it using various changing bond issues over the course of the history of the United States. 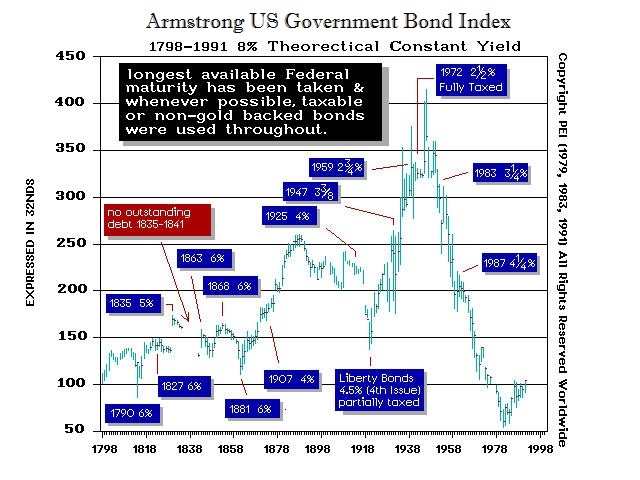 We always used the longest paper on a maturity perspective to create this perpetual view of US Government Bonds. We naturally incorporated this Index into our full computer database. 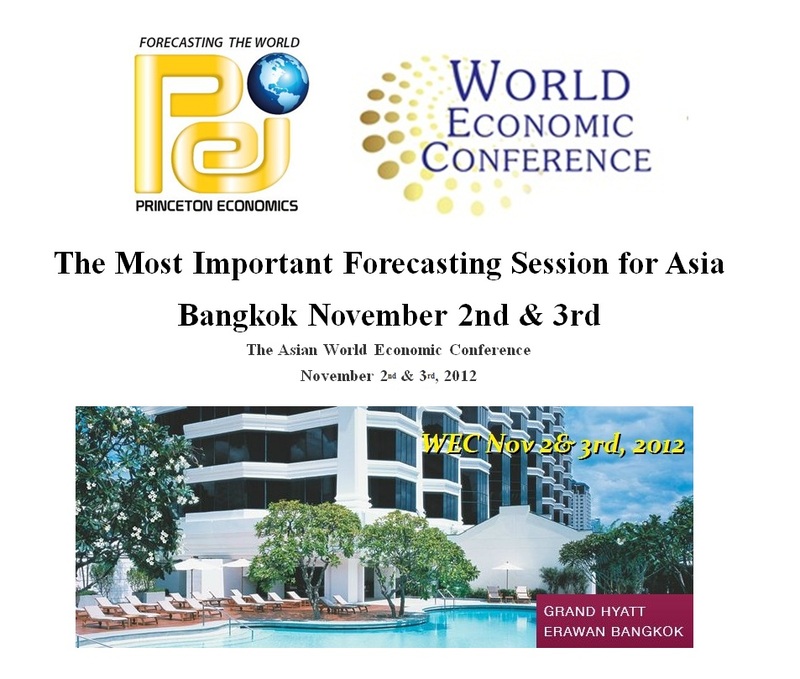 Here is the Forecasting Array for the Yearly Perspective. It is obvious that when the Economic Confidence Model peaks in 2015.75 and declines into 2020, we see a Panic Cycle in 2017 and rising volatility into 2019. Near-term, we see a Directional Change is due in 2012 and 2014 with volatility starting to rise in 2013. The top line in the Forecasting Array is the composite of 72 models. Thus, this is the sum of our fears and hopes. We can see that the important years will be 2014, 2016, and 2018. It looks like interest rates will start to rise and after 2015.75 is when we get into the default period. It appears that 2014 is shaping up to be a serious event. That is also when we have the War Cycle turning and that can also mean civil unrest rather than international war. Because interest rates are so low, the slightest uptick in rates will wipe out bond holdings extremely rapidly. In Japan, the banks are loaded to the gills with government debt. Deflation in Japan has been massive. A lunch in Marunouchi district in Tokyo was 1,000 yen in 1989. Today it is just 500 yen. That is visible deflation rarely seen. The Japanese banks can be wiped out in a single uptick. In the United States, pension funds are at extreme risk to a rate rise that will cause their bonds to free-fall. This is the real downside to low interest rates. The bondholders have bought the equivalent of the Nikkei on December 31st, 1989 or the Dow on September 3rd, 1929.